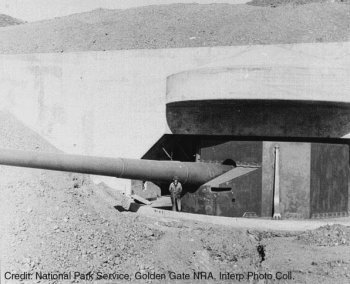 Fort Cronkhite (122.532W 37.833N) was located on the north side of the Golden Gate outside San Francisco Bay. The Army acquired some 800 acres( 324 hectares) of land here in 1937 for the construction of twin 16" (406mm) coastal guns, which were first test-fired on 1 July 1940. Three 3" (76mm) antiaircraft guns were also installed by the time war broke out in the Pacific. The fort was manned by 54 Coastal Artillery Regiment, an African-American unit equipped with 155mm guns. On 4 January 1944 a Commando Combat School was set up here.